Learning a foreign language can be frustrating for some people and very enjoyable for some others. Emotions are one of the most important factors in the use of English as a foreign language located in the center of attention of many researchers. One of the emotion-inducing contexts for learning English as a foreign language can be the setting of an imagined community. Our focus in this study was on the emergence of emotions, both positive and negative, of three groups of six university students engaged in an English-speaking literature criticism TV program as an imagined community. The program encompassed a specific day to discuss a fiction and a final report of the program specified for publication in one of the well-established literary bulletins. Each member constructed a specific imagined identity in each group as critics, photographers, reporters, and presenters competing with each other for the final selection of the best critique and presentation on the discussion day as well as the publication of the best report. A triangulation of data was gathered including an interview, observation, an open-ended questionnaire as well as personal journals which were qualitatively analyzed. The results showed the emergence of enjoyment resulting from the constructed imagined identities in the classroom as well as facilitative negative emotions such as anxiety leading to the consolidation of the participants’ imagined affiliations. Anderson, B. (2006). Imagined communities: Reflections on the origin and spread of nationalism. London: Verso Books. Arnold, J. (2011). Attention to affect in language learning. Anglistik. International Journal of English Studies, 22(1), 11-22. Arnold, J. & Brown, H. (1999). A map of the terrain. In J. Arnold (Ed. ), Affect in language learning (pp. 1-24). Cambridge: Cambridge University Press. Baider, F., Cislaru, G., & Coffey, S. (2015). Apprentissage, enseigement et affects (Learning, teaching and affects). Le language et l’homme, 50(1), 3-6. Blackledge, A. (2003). Imagining a monocultural community: Racialization of cultural practice in educational discourse. Journal of Language, Identity and Education, 2(4), 331–347. Borg, S. (2006). The distinctive characteristics of foreign language teachers. Language Teaching Research, 10(1), 3-31. Boudreau, C., MacIntyre, P. D., & Dewaele, J. M. (2018) Enjoyment and anxiety in second language communication: An idiodynamic approach. Studies in Second Language Learning and Teaching, 8(1), 149-170. Bown, J., & White, C. J. (2010). Affect in a self-regulatory framework for language learning. System, 38(3), 432-443. Cheng, Y. (2002) Factors associated with foreign language writing anxiety. Foreign Language Annals, 35(6), 647-656. Cheng, Y., Horwitz, E., & Schallert, D. (1999) Language anxiety: Differentiating writing and speaking components. Language Learning, 49(3), 417-446. Cohen, Y., & Norst, M. J. (1989). Fear, dependence and loss of self-esteem: Affective barriers in second language learning among adults. RELC Journal, 20(2), 61-77. Connelly, M., Clandinin, D., (1990). Stories of experience and narrative inquiry. Educational Researcher, 19(2), 2-14. Creswell, J. W. (2013). Research design: Qualitative, quantitative, and mixed methods approaches. London: Sage publications. Dagenais, D., Moore, D., Lamarre, S., Sabatier, C. & Armand, F. (2009). Linguistic landscape and language awareness. In E. Shohamy & D. Gorter (Eds), Linguistic Landscape: Expanding the Scenery (pp. 253–69). New York: Routledge. Denzin. K. & Lincoln. Y. S. (2000) Handbook of Qualitative Research. Sage publications, Thousand Oaks, California. Dewaele, J.-M. (2015). On emotions in foreign language learning and use. The Language Teacher, 39(3), 13-15. Deweale, J-M. & Alfawzan, M. (2018). Does the effect of enjoyment outweigh that of anxietyin foreign language performance? Studies in Second Language Learning and Teaching, 8(1), 21-45. Dewaele, J.-M., & Dewaele, L. (2017). The dynamic interactions in foreign language classroom anxiety and foreign language enjoyment of pupils aged 12 to 18. A pseudo-longitudinal investigation. 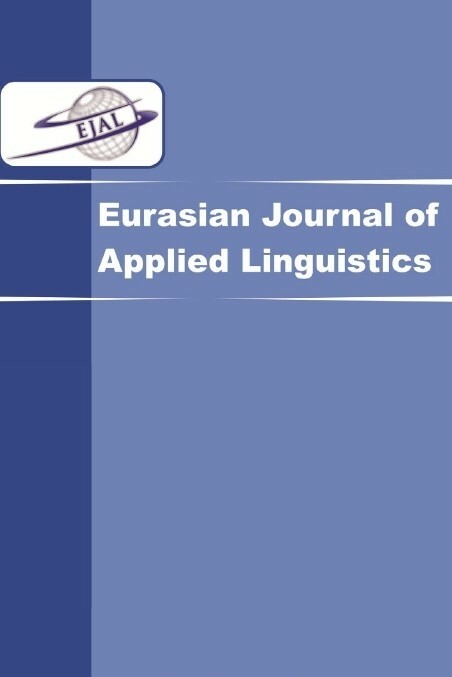 Journal of the European Second Language Association, 1(1). 1-20. Dewaele, J.-M., & Ip, T. S. (2013). The link between Foreign Language Classroom Anxiety, Second Language Tolerance of Ambiguity and self-rated English proficiency among Chinese learners. Studies in Second Language Learning and Teaching 3(1), 47-66. Dewaele,J.-M., & MacIntyre, P. D. (2014). The two faces of Janus? Anxiety and Enjoyment in the Foreign Language Classroom. Studies in Second Language Learning and Teaching, 4(2), 237-274. Dewaele,J.-M., & MacIntyre, P. D. (2016). Foreign Language Enjoyment and Foreign Language Classroom Anxiety. The right and left feet of FL learning? In P. D. MacIntyre, T. Gregersen, & S. Mercer (Eds. ), Positive Psychology in SLA (pp. 215-236). Bristol: Multilingual Matters. Dewaele, J.-M., & Pavlenko, A. (2001). Web questionnaire bilingualism and emotions. London: London University Press. Dewaele, J-M., MacIntyre, P. D., Boudreau, C., & Dewaele, L. (2016). Do girls have all the fun? Anxiety and enjoyment in the foreign language classroom. Theory and practice of second language acquisition, 2 (1), 41-63. Dörnyei, Z., & Murphey, T. (2003). Group dynamics in the language classroom. Cambridge: Cambridge University Press. Dörnyei, Z., & Csizér, K. (1998). Ten commandments for motivating language learners: Results of an empirical study. Language teaching research, 2(3), 203-229. Elahi Shirvan, M., & Talebzadeh, N. (2017). English as a foreign language learners’ anxiety and interlocutors’ status and familiarity: An idiodynamic perspective. Polish Psychological Bulletin, 48(4), 489-503. Elahi Shirvan, M., & Talebzadeh, N. (2018a). Exploring the Fluctuations of Foreign Language Enjoyment in Conversation: An Idiodynamic Perspective. Journal of Intercultural Communication Research, 48(1), 1-17. Elkhafaifi, H. (2005). Listening comprehension and anxiety in the Arabic language classroom. Modern Language Journal, 89(2), 206-220. Eysenck, M. W. (1979). Anxiety, learning and memory: A reconceptualization. Journal of Research in Personality, 13(4), 363-385. Fredrickson, B. L. (2003). The value of positive emotions. American Scientist, 91(4), 330-335. Fredrickson, B. L. (2013). Positive emotions broaden and build. Advances in Experimental Social Psychology, 47(1), 1-53. Gardner, R. C. (1985) Social psychology and second language learning: The role of attitudes and motivation. London: Edward Arnold. Garrett, P., & Young, R. (2009). Theorizing affect in foreign language learning: An analysis of one learner’s responses to a communicative-based Portuguese course. The Modern Language Journal, 93(2), 209-226. Gregersen, T., & Horwitz, E. (2002) Language learning and perfectionism: Anxious and non-anxious language learners’ reactions to their own oral performance. Modern Language Journal, 86(4), 562-570. Gregersen, T., MacIntyre, P. D. (2014). Capitalizing on individual differences: From premise to practice. Bristol: Multilingual Matters. Gregersen, T., Macintyre, P. D., & Meza, M. D. (2014). The motion of emotion: Idiodynamic case studies of learners' foreign language anxiety. The Modern Language Journal, 98(2), 574-588. Hewitt, E., & Stephenson, J. (2012). Foreign language anxiety and oral exam performance: A replication of Phillips’s MLJ study. Modern Language Journal, 96, 170-189. Horwitz, E. K. (1990). Attending to the affective domain in the foreign language classroom. In S. S. Magnam (Ed. ), Shifting the instructional focus to the learner (pp. 15-33). Middlebury, VT: Northeast Conference on the Teaching of Foreign Languages. Horwitz, E. K. (2001). Language anxiety and achievement. Annual Review of Applied Linguistics, 21(1), 112-126. Horwitz, E. K., Horwitz, M. B., & Cope, J. (1986). Foreign language classroom anxiety. The Modern Language Journal, 70, 125-132. Imai, Y. (2010). Emotions in SLA: New insights from collaborative learning for an EFL classroom. Modern Language Journal, 94(2), 278-292. Kanno, Y. (2000). Bilingualism and identity: The stories of Japanese returnees. International Journal of Bilingual Education and Bilingualism, 3(1), 1–18. Kanno, Y. (2003). Negotiating bilingual and bicultural identities: Japanese returnees betwixt two worlds. Mahwah, NJ: Lawrence Erlbaum Associates, Inc.
Kanno, Y. & Norton, B. (2003). Imagined communities and educational possibilities. Journal of Language, Identity, and Education, 2(4), 241–49. Kleinmann, H. H. (1977). Avoidance behaviour in adult second language acquisition. Language Learning, 27(1), 93-107. Kolehmainen, M. (2017). Positivity as a resource for learning: enjoyment in the English classroom in Finland (bachelor’s thesis). University of Jyväskylä, Jyväskylä, Finland. Lu, Z., & Liu, M. (2011). Foreign language anxiety and strategy use: A study with Chinese undergraduate EFL learners. Journal of Language Teaching and Research, 2(6), 1298-1305. MacIntyre, P. D. (1999). Language anxiety: A review of the research for language teachers. In D. J. Young (Ed. ), Affect in foreign language and second language teaching: A practical guide to creating a low-anxiety classroom atmosphere (pp. 24-45). Boston: Mc Graw-Hill. MacIntyre, P. D., & Gardner, R. C. (1994a). The effects of induced anxiety on cognitive processing in computerised vocabulary learning. Studies in Second Language Acquisition, 16(1), 1-17. MacIntyre, P. D., & Gardner, R. C. (1994b). The subtle effects of language anxiety on cognitive processing in the second language. Language Learning, 44(2), 283-305. MacIntyre, P. D., & Gregersen, T. (2012). Emotions that facilitate language learning: The positive–broadening power of the imagination. Studies in Second Language Learning and Teaching, 2, 193–213. MacIntyre, P. D., & Legatto, J. J. (2010). A dynamic system approach to willingness to communicate: Developing an idiodynamic method to capture rapidly changing affect. Applied Linguistics, 32(2), 149-171. MacIntyre, P., & Vincze, L. (2017). Positive and negative emotions underlie motivation for L2 learning. Studies in Second Language Learning and Teaching, 7(1), 61-88. Mellon, C. A. (2015). Library anxiety: A grounded theory and its development. College & Research Libraries, 76(3), 276-282. Murphy, R. S. (2010). Where does psychology and second language acquisition research connect? An interview with Zoltán Dörnyei. The Language Teacher, 34(2), 19-23. Norton, B. (2000). Identity and Language Learning: Gender, Ethnicity and Educational Change. London: Pearson Education. Norton, B. (2010). Language and identity. In N. Hornberger & S. McKay (Eds), Sociolinguistics and Language Education (pp. 349–69). Bristol: Multilingual Matters. Norton, B., & Kamal, F. (2003). The imagined communities of English language learners in a Pakistani school. Journal of language, identity, and education, 2(4), 301-317. Norton, B. & McKinney, C. (2011). An identity approach to second language acquisition. In D. Atkinson (Ed. ), Alternative Approaches to Second Language Acquisition (pp. 73–94). Oxford: Routledge. Norton, B., & Toohey, K. (2011). Identity, language learning, and social change. Language teaching, 44(4), 412-446. Pavlenko, A., (2007). Autobiographical narratives as data in applied linguistics. Applied Linguistics, 28 (2), 163–188. Pavlenko, A. & Norton, B. (2007). Imagined communities, identity, and English language learning. In J. Cummins & C. Davison (Eds), International Handbook of English Language Teaching (pp. 669–80). New York: Springer. Pemberton, R., & Cooker, L. (2012). Self-directed learning: Concepts, practice, and a novel research methodology. In S. Mercer, S. Ryan, & M. Williams (Eds). Psychology for language learning: Insights from research, theory and practice (pp. 203-219). London: Palgrave Macmillan. Reeve, J. (2015). Understanding motivation and emotion (6th ed.) Hoboken, NJ: Wiley. Rivers, W. (1981). Teaching foreign language skills. Chicago: The University of Chicago Press. Saito, Y., Garza, T., & Horwitz, E. (1999). Foreign language reading anxiety. The Modern Language Journal, 83(2), 202-218. Scovel, T. (1978). The effect of affect on foreign language learning: A review of the anxiety research. Language Learning, 28(1), 129-142. Shoaib, A. & Dornyei, Z. (2005). Affective in life-long learning: Exploring L2 motivation as a dynamic process. In P. Benson and D. Nunan (Eds), Learners’ Stories: Difference and Diversity in Language Learning (pp. 22–41). Cambridge: Cambridge University Press. Schwieter, J. W. (2013). The foreign language imagined learning community: Developing identity and increasing investment. In D. J. Rivers and S. A. Houghton (Eds.). Social identities and multiple selves in foreign language education (pp. 139-155). A&C Black. Silberstein, S. (2003). Imagined communities and national fantasies in the O. J. Simpson case. Journal of Language, Identity, and Education, 2(4), 319–30. Silverman, D. (2000). Doing qualitative research. London: Sage Publications. Swain, M. (2013). The inseparability of cognition and emotion in second language learning. Language Teaching,46(2), 195-207. Williams, M., Burden, R., Poulet, G., & Maun, I. (2004). Learners' perceptions of their successes and failures in foreign language learning. Language Learning Journal, 30(1), 19-29.